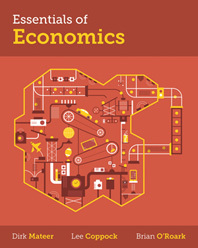 Visit the showcase site for Essentials of Economics. 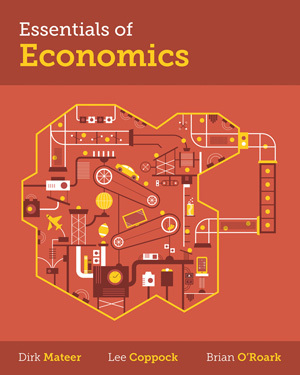 Written by Dirk Mateer, Lee Coppock, and Brian O’Roark—three of the leading economics instructors in the country—Essentials of Economics brings insights and practices refined over a combined 50 years in the classroom to a survey text that is student-centered, from the ground up. A concise, clear narrative connects economic concepts to real life through relevant stories and everyday examples, while a pedagogical framework provides tips for teaching the material in a highly visual, interactive manner. Every chapter begins and ends with Big Questions that highlight important topics that will be covered in the pages that follow. A related Answering the Big Questions feature at the end of each chapter reinforces key concepts. These Big Questions also organize the activities featured in The Ultimate Guide to Teaching Essentials of Economics, ensuring that the content correlates seamlessly with the parent text. A variety of current and accessible examples help students apply economics to both the real world and their own lives. - Practice What You Know features encourage study and self-assessment by framing problems through examples students would encounter in their lives such as saving money for college, buying groceries, costs associated with the internet, fracking and watching Spongebob. - Economics in the Real World features reinforce relevance by connecting economic concepts to current events, such as the disruption in taxi monopolies caused by rise of Uber and Lyft in Chapter 6. - Economics in the Media boxes in every chapter draw on pop culture to illustrate economics, including Despicable Me (Loanable Funds, Chapter 14) and Austin Powers (Price Level and Inflation, Chapter 11). - Economics for Life boxes focus on what students care about—how economics impacts people, including themselves. For example, Chapter 12 explores the stark unemployment numbers for workers without four-year college degrees and the probabilities of job outsourcing. A range of features throughout the text and media package challenges students to think critically, interpret concepts, and truly engage with economics. - Practice What You Know features explain the mathematics underlying economic concepts, such as elasticity and calculating the GDP to extrapolate the economic health of a nation. - At the end of each chapter, the authors work through two completely solved problems, highlighting important concepts and building the skills students will need for exams. - A Misconceptions feature at the beginning of every chapter introduces erroneous assumptions that will be addressed in the pages to follow, and challenges students to critically examine their preconceptions from the outset. - InQuizitive is a formative, adaptive learning tool that improves student understanding of important concepts tied to the text’s learning objectives. Students receive personalized quiz questions on the topics for which they need the most help, and InQuizitive motivates students to actively engage with their reading by integrating book content such as graphs, tables, data, and examples, creating an engaging learning environment that improves student retention of the most important material. - Every problem featured in InQuizitive and the Coursepack was developed specifically for Essentials of Economics, offering complete correlation and consistency between examples featured in the text, the Office Hour videos, and the Scratch Paper graphing tutorials. 5. Costs and Production: How Do Businesses Work?